500 only on heavyweight vinyl. "Manchester Aid to Kosovo (MaK) is a charity which has supported recovery in Kosovo since 1999. MaK receives a third of its income from the Manchester music industry. 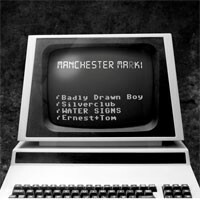 MaK has produced two albums of Manchester music 'Cohesion' (2001) and ‘Ten’ (2011) and presented many concerts, both albums and concerts have included artists such as Doves, Elbow, Badly Drawn Boy, Mr Scruff, Ian Brown, Liam Frost, The Travelling Band, I Am Kloot, Jim Noir & Stephen Fretwell. After the success of 'Ten', for the next wave of activity, MaK Records will be releasing 4 limited edition (500) 12" records on heavyweight vinyl, over the space of a year (one each quarter from autumn 2011) exclusively through Piccadilly records, these releases will NOT be available digitally or on CD. At the end of these quarterly releases the 12 tracks will be converted into a digital/CD release with some guest tracks from around the world to create the third MaK album. 12” 1 includes exclusive tracks from Bady Drawn Boy, Silverclub, WATER SIGNS & Ernest+Tom. The first, taking up a whole side is a 16 minute (count them!) gem from a Manchester legend, the latter three, hotly tipped artists who are all making waves on Manchester’s vibrant electronic-pop scene. For this first 12”, all proceeds will go to helping provide IT support to Kosovo. Artists slated for future 12”s include Doves/Jimi Goodwin, I Am Kloot, Frasier King, Airship, Golden Glow, Travelling Band and many more." For more information on Manchester Aid To Kosovo click here.